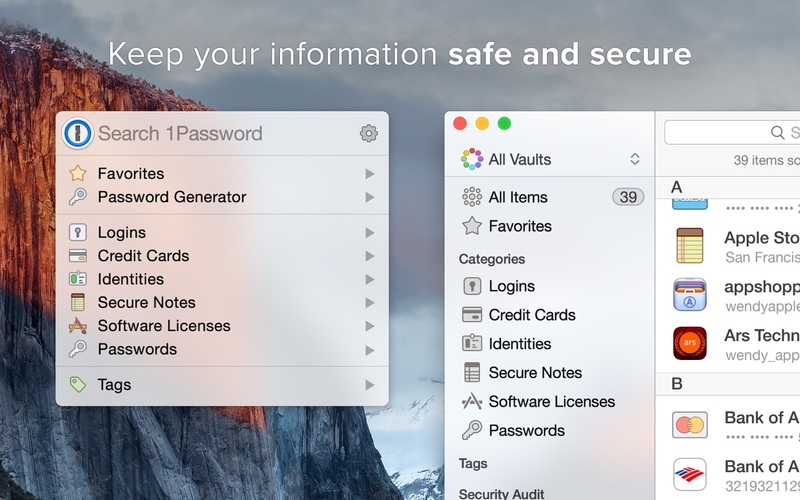 1Password 6.8.6 – Powerful password manager. 1Password fully supports major Web browsers, including Safari, Firefox, Chrome, and Opera. All browser extensions share the same encrypted data which means you never need to manually copy your passwords between browsers or from the password manager to a browser ever again! 1Password has received numerous awards, including 5 mice from Macworld magazine, MacLife Editors pick, and was the Pick of Week on MacBreak Weekly by both Leo Laporte and Merlin Mann. 1Password is also available for and syncs with Windows, iOS, and Android. iCloud sync has been reimplemented using Apple's native iCloud framework. Quick Look windows now close when 1Password is locked. When fetching rich icons, 1Password will not request icons for items with invalid URLs. Next story AirPlayer Pro 2.4.2.3 – Wireless AirPlay receiver for Mac. Previous story Twitterrific 5.2.3 – Effortlessly read and compose tweets. oneSafe 1.4.2 – Password management app. 1Password 6.7.1 – Powerful password manager.